This is the second instalment of a series of five posts that I have started in order to expand on a short answer I gave to Mike Harrison over on the IATEFL Facebook group page in response to the question what makes a lesson GREAT? It was the capitalisation that gave me the idea to fit my ideas on this into the letters composing the word at issue – GREAT. The first post, on Group Dynamic, you can find here. In writing it, I noticed that far from being an answer, it threw up a whole load of questions around the idea that I had blithely posted earlier. This is one thing I love about these short professional development exchanges on the IATEFL and IATEFL SIG facebook pages, and I encourage you all to take part here and here for starters. closely connected or appropriate to the matter at hand : the candidate’s experience is relevant to the job. ORIGIN early 16th cent. (as a Scots legal term meaning [legally pertinent] ): from medieval Latin relevant- ‘raising up,’ from Latin relevare. Fascinating: I had no idea that the term relevance was coined by Scots lawyers, did you? Anyway, the idea of being closely connected or appropriate to the matter at hand seems straightforward enough. “the matter at hand” – for a language learner – would seem to be the gaining of mastery in a target language. It would suggest that for a lesson to be relevant, its content and or process would be demonstrably linked or linkable to the learners’ search for mastery in that area. For a start, how can we as teachers be sure that the linguistic content of our lessons is as closely connected to the learners and their matter at hand as possible? Needs analysis? Well, needs change, and – if complexity theory really has any relevance to language acquisition – they do so unpredictably, so how often can/should needs be reassessed? Every month? Every week? Every lesson? Before or after the lesson? During it? Naturally, teachers in the real world need to strike a pragmatic and effective balance – but how are we to know that we are managing just that? Progress testing is the usual yardstick, I suspect, but performance on tests and performance in real-life do not always correlate. And how often have you found out what your learners really need in terms of language from a pre-course needs analysis? I mean, really? More often than not, the language that my learners really found germane was the stuff that came up in passing, and it rarely had its roots in anything they mentioned during a needs analysis. I’m jumping the gun here with my next post (E for Emergent Language) so I’ll leave this for now. You might counter this with “that’s poorly done needs analysis” and maybe you would be right, but this doesn’t change the fact that needs change over time and this point of change is unpredictable – how to manage that? Further, if tests are based primarily on pre-determined content as defined in a syllabus or course programme, and if the tests are not adapted to allow for this incidental learning also to be weighted, then the learners’ learning is only partially being given credit. Keeping and sharing learner and teacher journals may be a help here, as they are as concrete a form as any of capturing learner interlanguage and point-of-time interests and occupations as I can imagine. Do you have any other ideas? The idea of relevance of being a quality of “raising up” suggests to me that for a lesson to be relevant, it also has to have a distinct profile, it needs to be accentuated, needs to be marked somehow for relevance so that the learners’ radars have as easy a job as possible of noticing its potential relevance, thus increasing their chances of engagement with it. A positive group dynamic may lead to learners creating their own lessons and thereby making sure their lessons are relvant (see the postscript to my last post on group dynamic for a case study and Brad Patterson’s comment as well) but short of this, using what you know of your learners (professional or personal) lives as a starting point may be the simplest thing to do. This doesn’t necessarily mean that published learning material such as coursebooks cannot or should not be used, but that it is approached via the learners’ lives, rather than the other way round. Coursebooks used to leave so-called personalisation activities to either the last corner of a unit or – worse – the teacher’s resource book. Coursebook writers have done good work in recent years in making the people in the room the starting point of their units and modules, reflecting in the process a move away from materials driven to learner conversation driven teaching – but teachers can do more than this to make their lessons truly relevant for their learners too – and I mean truly, not just making a best fit between the contents of a syllabus drawn up by ministries etc and the realities on the ground in class. The language course where I am now in Istanbul insists on teachers giving the (usually adult) learners a “progress test” every 8 weeks to guage their level. As far as I know I am the only teacher who creates personalised tests for each of my groups. At the moment, I am using a fairly standardized template, but customizing the contents to include language that has come up in the preceding lessons only in THOSE classes, with THOSE learners. (I get a kick out of actually including details about the learners themselves and me in the test too). Anyway, I still want to make the tests more personalize, so I decided with the next ones I am going to ask the learners to beforehand negotiate the content themselves. We will see what they want to be tested on and then collaborate on designing different tasks. Never tried this before, so quite excited about it. I think personalizing tests as far as possible is a good idea. Further, Roger House, a teacher trainer at IH Barcelona, said at the Unplugged Conference earlier this year something to the effect that it is only the learner themselves who is in a real position to say what they are capable of – this was in the context of advocating handing over descriptors to learners and allowing self assessment. Please keep me up to date about how it all goes! 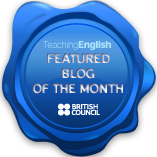 Thought this would really interest readers on the TeachingEnglish facebook page TeachingEnglish facebook page. Perhaps you’d like to check there for comments. Thanks, Ann: I’ll stop by soon. June 30, 2012 - 5:26 pm Pingback: Learner Diaries; A summary | Five against one: Teaching against the odds.